South Korea has denied a claim by US activist fund Elliott Associates that it gave discreet backing for a 2015 merger of two Samsung units and caused the firm to suffer losses from what it calls an unfair deal, a document from Seoul's justice ministry showed Friday. The Ministry of Justice released its official government response to the notice of arbitration lodged by Elliott in April. The two sides failed to settle the matter and they face an investor-state dispute through an international tribunal. Elliott seeks US$770 million in damages for its investment in Samsung C&T Corp. The firm held a 7 percent stake in the company when it pushed for merger with Cheil Industries Inc. Elliott challenged the deal with a proxy fight, citing unfair terms that it said greatly undervalued the company and investors' interest. The merger went ahead on the back of the state-run National Pension Service's swing vote in Samsung's favor. The deal later became the center of a massive corruption scandal after Samsung Electronics Vice Chairman Lee Jae-yong, heir to the business empire, was arrested over the case. 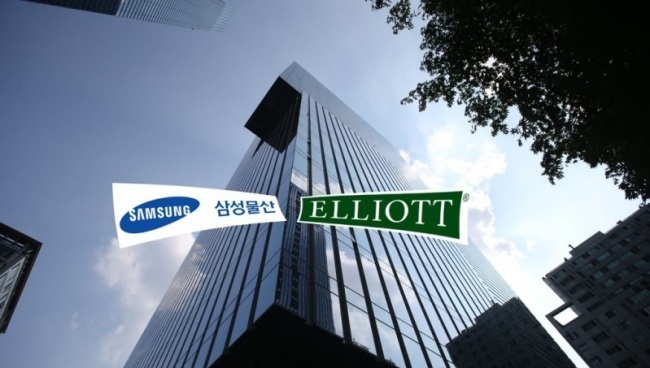 Elliott has insisted the merger was possible because Samsung won implicit backing from the-then Park Geun-hye government in exchange for illegal provision of massive funding to a friend of Park. In the response, the Seoul government said the allegations were "wholly unsupported" by either witness or expert evidence. It pointed out that criminal trials are still under way in Korea over Samsung's alleged involvement in a corruption scandal that led to Park's ousting. South Korean courts have drawn no conclusion that the merger passed with the help of the president, government or related government entities, and the case is pending in the courts, the government said. Lee was freed in February after winning his appeal. The appellate court ruled there was a lack of evidence for any "implied or implicit approval" from Park's office about the merger. The government noted Elliott's accusations are largely based on unconfirmed facts from media reports and that it failed to provide a rationale for the calculation regarding damages.